There are a handful of healthy diets that are commonly mentioned in the Paleo and functional medicine realm. One of these is the SCD diet, or Specific Carbohydrate Diet. Today we speak with Steven Wright, who provides easy steps to get started with the SCD diet and how you can use it to improve your gut health. If you need help implementing a gut-healing diet, click here. Dr. Michael Ruscio: Hey, everyone. Welcome to Dr. Ruscio Radio. I am here with my good friend and super fun guy, Steven Wright, from SCDLifestyle.com. Hey, Steven, how are you? Steven Wright: Doing well, man. How about yourself? DrMR: I’m great. Thanks for coming on the show. And it’s kind of nice to catch up with you. It’s been awhile since I saw you. But it’s always good to chat. So I’m glad we had a little off-air catch-up time. And I’m looking forward to diving deep into all things regarding the SCD diet. SW: Yeah, me too. I’m just grateful to be on your show. And you and I always have insightful conversations about gut health. And so just hoping we can drop some good knowledge and tips today for anybody struggling. DrMR: Definitely. Definitely. So one of the things I’d like to start with—I guess, for the audience, the SCD diet stands for the Specific Carbohydrate Diet. And it’s one of the diets that you hear thrown in the mix with some of the common diets kind of in the Paleo/functional medicine space. You’ll hear Paleo. You’ll hear AIP. You’ll hear low-FODMAP. You’ll hear SCD. You may hear GAPS. And you may hear a low-fermentability diet. And a lot of these have a lot of overlap. But I thought it’d be nice to bring on Steven, doing so much coaching with the SCD diet, to give us a basic intro to the SCD diet. So there are a number of questions, Steven, I want to ask you. But I guess the first one would be, what’s the purpose of the SCD diet? Is there a certain purpose or person that this really works best for? SW: Yeah, that’s a good question. I’m personally biased because the Specific Carbohydrate Diet is what liberated me from my daily digestive cramping and bloating pain. It’s also the diet that stopped my business partner and best friend, Jordan’s, diarrhea after four years of essentially being gluten free, having celiac disease, and nothing was working. And so I’m partially biased, as well as working with tens of thousands of people over the last seven years, that I think a personally tuned version of the Specific Carbohydrate Diet is the best digestive diet tool that someone could use to get symptom free and sort of buy themselves short-term time to actually use functional medicine to get well. And so I’ve seen it work for everybody from Crohn’s; ulcerative colitis; people like me who are undiagnosed but of course we had parasites or adrenal issues, all kinds of complex things; up to multiple chemical sensitivity; extreme fibromyalgia; and every sort of autoimmune condition in the middle. So I’ve seen it work for a lot of people. But I think the key to the Specific Carbohydrate Diet—and the one key that I want everyone to write down or leave with is that there’s no one set of diet rules, in my opinion, out there for you. It’s sort of a relationship you need to build with your body. And so there are frameworks like the Specific Carbohydrate Diet that can give you a leg up. But even inside of that framework, whether you choose this or AIP or something else, there’s a level of tailoring that I think needs to happen to get maximal results. DrMR: I totally agree. And I think it’s really important to mention that because what I see in the clinic is sometimes people get really wigged out because they’re trying to follow a certain diet. But they’re driving themselves crazy with trying to conform to every rule. And one of the things I always coach people through is it’s not about following the diets to a T 100% perfectly but rather here’s a diet. Let’s move you in the general direction of this diet and follow it as best you can. And let’s see what type of impact this has. And if it’s working well, we’ll keep moving in that direction. And you can observe how certain foods within the diet work well for you or don’t work well for you. And really the diet is just, in my opinion—most diets are a tool to help bring your awareness to foods that may work for you or may not work for you. But ultimately after time and observation, you’ll settle into your own unique version of whatever diet it is. And they are just pouring their heart and soul and their will power into it and still suffering on a daily basis. And from what I’ve seen, it really shouldn’t be something that you need to suffer through. The hardest part, I think, is just having the courage to continue to iterate until you figure out that right combination. DrMR: I totally agree with that. And I’m so glad that you made that point. If people are using a diet, especially for symptoms of course, then I totally agree. I don’t think it’s something where, “Oh, you need to stay on the AIP past two weeks into the third week or the fourth week or the sixth week.” Or, “I hear that at week seven is when things really start to change.” Definitely, that’s not been my experience in the clinic. It’s, if these things are working, people are going to start noticing improvement within a few days and then realize maybe the brunt of the improvement within a few weeks. I think the 30-day rule is nice from a perspective of, if you’re trying to make a lifestyle shift, give it 30 days so you can kind of fall into a rhythm and get efficient with it. And it can be something that feels a little bit more habitual. I think it’s sound advice from that perspective, yes. But from the perspective of a more clinical, how-is-this-helping-with-my-symptoms, totally agreed that if you’re not noticing improvement within the first couple weeks, then a modification needs to be made, or a change needs to be made. Yeah, that’s a great point. SW: Yeah, thanks, man. And I just want to throw in there—and I’m sure we can dive into this near the end. But I don’t want to hijack it too far. But sometimes, that modification has to do with supplements for your digestion for that new dietary protocol you’re choosing—so in the case of pancreatic insufficiency, brush border enzyme insufficiency, low stomach acid, things like that. So really I guess probably what both of us are advocating for is—what I like to try on is try to make this like an experiment—like a fun experiment—where you sort of reestablish a new relationship with your body and with food. And that way, when I word it like that, what I’m hoping is that people can try on the idea that there is no right or wrong here. There are just fewer symptoms and more symptoms. And just kind of following that winding river till you get to a place where you’re feeling better and better. And I think that framing it that way is really important because, again, I’m always saddened by the patients that come in just beating themselves up mentally with diet. And it’s remarkable to me that sometimes when we just have a simple conversation that reframes this, they go from beating themselves up chronically to looking at this like something that should be fun and experimental. And it just takes a huge stress and a huge burden off people. So totally in complete agreement with you there. So we’ve talked about—I guess the purpose would be gut healing, which has so many other things that it can help. So in terms of who does it work best for, very broad because the influence of the gut is so diverse. What about the basic rules or an outline? If someone wanted to get started, what are some of the broad strokes in terms of what this diet looks like—eat this, avoid that, and so on? SW: Sure, yeah. So again, just to preface this, I think the Specific Carbohydrate Diet is the best digestive dietary tool, meaning I don’t necessarily advocate that someone stay on Specific Carbohydrate Diet past their functional medicine intervention. I think that what I’m about to explain is, for instance, the Specific Carbohydrate Diet by definition at this point in time is grain free. It’s polysaccharide free, meaning it’s starch free, and a lot of legumes are cut out. It’s processed-food free basically. And it’s all added-sugar free. Personally, I do not think that there’s anything wrong with, for instance, starch except for if your body can’t actually digest it and use it and is causing issues. So I find it to be an extremely proficient tool at helping with any sort of chronic issues. But over your lifetime and over your recovery of your health, I do like the idea of transitioning off it as soon as your gut is able to handle more complex carbohydrates. And so SCD in general is essentially cutting out 99% of all carbohydrates that are not monosaccharides. So essentially, carbohydrates are broken up into three macro categories of monosaccharides, disaccharides, and polysaccharides. And so the Specific Carbohydrate Diet is really focused in on eliminating the di- and the polysaccharides. And the reason why is there are bonds that are in between. A di- means two molecules. Poly means many. So those carbohydrate molecules have bonds that need to be cleaved by enzymes usually brush border enzymes. And with a lot of people who have digestive issues, typically, they either have blunted villi or completely flattened villi. There is some sort of inflammation going on. And those villi are where those carbohydrate molecules are cleaved by the enzymes and then absorbed. And so I think that’s basically the best tenant other than it also removes grains and other things. Through that methodology, it ends up lining up very much in line with something like an AIP diet. It does allow fermented dairy. And it does allow some legumes. And so that is kind of because of just the evolution of the diet. So for instance, I’m not the creator of the diet. The most well-known book out there is called Breaking the Vicious Cycle, written by Elaine Gottschall. She’s not the creator of the diet. Actually, the diet comes from Dr. Sidney Haas and some of his colleagues. Yeah, so the first research paper was published back in the 1920s by Dr. Sidney Haas and some colleagues. And they were working with celiac disease kids who were literally just dying. That was your prognosis. You were going to die if you were a celiac baby back in the 1920s. And so they figured out just through trial and error a group of foods that allowed these kids not only to stop dying but actually recover. And from Dr. Sidney Haas’s book that he published in the 1950s, according to him, they were actually eating gluten again. And so now I’m not advocating that. And I’m not saying that I’ve actually see that in practice yet. But just to give you a reference of the fact that that’s kind of where the diet came from. There was no research yet on grains or inflammatory oils, things like that. It was just trial and error in the clinical setting. And then Elaine Gottschall sort of innovated it in the 1990s. And then Jordan and I, after Elaine passed away, have kind of innovated again on top of it, bringing in the research that we now have regarding dairy and legumes and inflammatory oils. And so I do recommend that the new “protocol” for the Specific Carbohydrate Diet does get rid of your high omega-6, very processed oils. I do recommend that you go dairy free for the first 30 days and you go legume free until later on in the diet. I actually don’t think of foods as healthy or unhealthy. I just think about bodies and whether or not they can actually digest and assimilate types of food. And so I think that’s a really long-winded answer to suggest that the Specific Carbohydrate Diet is—really the tenant underneath it all is based on the digestibility of carbohydrate structures, which is related to usually inflammation or damage in the gut. And it has a long history behind it, over 100 years of research of behind it, giving it success. DrMR: Yep. No, I think you make a lot of great points. And I hope people either listening or reading this are starting to connect a common thread with a lot of these diets, which has to do with carbohydrates. Especially, when the gut is damaged or inflamed, certain types of carbohydrates can either feed problems or be hard to digest and absorb and therefore feed symptoms. And so the carbohydrate piece is definitely a really, really important piece. Of course, things like food quality are important. But once we get past some of those basic tenants of a healthy diet, the carbohydrate piece can be really, really powerful. And we’ve talked in the past about low-FODMAP. And we talked previously with Norm Robillard about the low-fermentability diet. One of the things I’m curious to get your thoughts on, Steven, is there is some similarity between low-FODMAP and SCD, but there are some differences. And I oftentimes, if someone is having a lot of digestive symptoms, I’ll recommend a combination low-FODMAP and SCD-compliant approach, which actually, I think, when I’ve done a comparison to the low-fermentability diet that’s recommended by Dr. Robillard, the low-fermentability diet and the low-FODMAP/SCD diet seem to have a lot of similarities. We’re really just pulling out a lot of these carbohydrates that are hard to absorb or fermentable or what have you. But I guess the question I’m asking is, low-FODMAP versus SCD—what are your thoughts in terms of the differences between those two and any thoughts on that? SW: Yeah, so I think the FODMAP diet and the FODMAP research that those people have put out has just been phenomenal. It’s helped move the conversation forward. And I think there’s definitely some truth to it. But I actually don’t really love the FODMAP diet. And I don’t love the message coming out of that camp for the same reason why I don’t actually advocate staying on SCD forever—because FODMAPs and polysaccharides, which are “forbidden” on the SCD diet, are super important for feeding the gut flora. Well, the fastest way I know for that to stop is to start off with essentially the SCD intro diet, which is like this chicken soup concoction and maybe some gelatin if you’re okay with collagen and things like that and literally go meats and fats—healthy fats are essentially considered in my book to be inert as long as you have enough stomach acid. But then essentially go vegetable and fruit group—every single vegetable, you introduce it over three days in increasing quantity. And if it doesn’t work for you, then that vegetable is out for the next 30 to 60 days. If you introduce a fruit and it doesn’t work for you over three to four days, then you pull that out. And so that’s kind of what we lay out in our Specific Carbohydrate Diet e-book is that whole process. And when you do that kind of process, I’m not really convinced that you’re doing the Specific Carbohydrate Diet or the low-FODMAP diet or AIP or anything because in the end, everybody will end up with a custom set of foods that we like to call the safe zone. So you figure out probably in about the first 30 to 45 days. You’ve tested a number of fruits, vegetables, meats, fats, things like that. And you now have this set of safe foods you know you can eat them at any time and feel great. And the goal is then to just keep pushing that bubble out. And so for instance, a lot of people will go on SCD, and they don’t do it this way. Or they go GAPS; they don’t do it this way. And by “this way,” I mean slowly trying the different types of food. And then they’ll end up on a diet—and this happens on paleo too—of having nuts at every meal. And like you were saying, maybe potentially eating a high-FODMAP diet but not knowing it because they put garlic and onions in every single dish they cook because they taste great. Why not use them? And the reason why is you can bend these frameworks to end up in situations where you are just suffering. The thing that’s worked for every single person I’ve ever used with it is this really logical progression through the different types of fruits and vegetables. And in the end, I think there are some medium-FODMAP foods or even some high-FODMAP foods that I witness people being able to eat in plenty quantity and not have any issue. But then there are other high-FODMAP foods that they can’t eat even a bite full. So again, I just get wary of any diet that slams one type of food out forever. And I love the idea of—and I know it’s nuanced, and it can take time. But I love this idea of really gradually just finding out, is my body okay with asparagus? Is my body okay with onions? Okay, it’s not. That sucked. So I put that aside for a few months, let some healing happen. So does that answer the question? DrMR: Yeah, no. It does. And I really, really agree with your point of starting off very restrictive and then working your way outward and constantly be trying to find the broadest diet possible. I think that’s a really, really important point for people—if nothing else, for their sanity—so they can feel like they’re no longer handcuffed to a super restrictive diet. But also that approach of starting very clean or safe, if you will, and then working outward slowly is a great way to figure out what combination of SCD principles, low-FODMAP principles, Paleo principles you need to incorporate into your diet because really that’s where I think the best approach comes from where you just personalize the foods that work for you because, like I said earlier, these diets are, I think, a guide to help us maybe pinpoint foods that are more likely to be problematic more quickly. But eventually, we have to go through that, “Okay, this food did work. This food did not work. And I’m going to make the staples of my diet reflect the things that I know I can eat and be careful with the things that I know I have to be careful with.” So totally, I think that’s a great answer. SW: Thanks. Yeah, and you just hit on something there that I think—so in my head I’m picturing—some of the limitations of podcasting right now. But I’m sort of picturing a bullseye or something. And in the middle, you have your really safe meats and fats and whatever you can digest that works really well—maybe a few fruits and vegetables. And then each ring out, you’re just slowly always trying to maybe push a little bit up and to the right. And you go out a few rings into the red up to the right towards—maybe starches are actually okay for you. But if you push down to the left into dairy, it’s like a no go. Or maybe you push over another way, and it’s a no go for starches or something like that, or nuts or even eggs. But over time, always kind of thinking about your diet as pushing out in the rings of the bullseye but also knowing that—let’s say that you’ve been on one of the diets. You’re making some leaps and bounds in your healing. And this framework is working for you. And then all of a sudden, your best friend has a baby, but there are complications. And now you’re at the hospital. You’re high stressed. You’re looking after your best friend. You’re taking care of their house and their dogs. And all of a sudden your digestive symptoms are back with a vengeance. And a lot of times, in that moment of crisis, you won’t do a whole lot. But then a week later, it’ll still be happening. 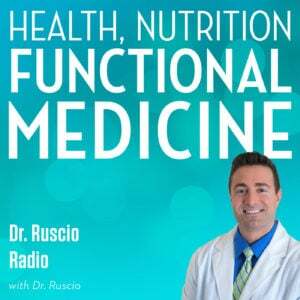 And you’ll start to say, “Well, screw that FODMAP diet.” Or, “That SCD diet doesn’t work anymore.” And the reality really is that these stressful situations that are just called life—it happens to even Dr. Ruscio and me—where we get into stressful situations. And sometimes, I have to dial my diet back a little bit when things like this happen. And so my hope is that if I can get someone in this really cool relationship where they’re looking at each food group as, how does this onion taste? What can I do with it? How much can I eat with it? And then, oh, I get a little sensitive. And so you can start to imprint which foods are on the fringes of what you’re capable of. And then if you get into a situation, which we’re all going to get into with our lives, you know which food groups to maybe cut out right away, kind of get back to a safe zone where you can feel good. And then add those back in as the crisis passes and the stress passes. DrMR: Yeah, no, great point. That’s exactly what I end up doing myself where if there’s a period where I’m pushing too hard and maybe not sleeping enough and overly stressed—thankfully, these days for me are getting farther and fewer between as things are all coming into place. But if I go through one of those periods, and especially I’m noticing—and I’m saddened to report it—for me, coffee or espresso, that is just not good for my gut. And I have been suspicious of that maybe two years now. But definitely, the longer I’m away from that, the better my gut is. And what I have learned is that typically when times get tough and there’s a lot to do and not a lot of time to do it in, that’s both stressful, tends to be accompanied by sleep reduction, and also accompanied by espresso consumption. And I’ve noticed for me that I will start to not be able to eat the foods that were my staple foods, which tend to be lots of asparagus, broccoli, cauliflower, kale, chard, in addition to healthy meat and fish and what have you. I have to pull back those higher FODMAP and higher carbohydrate and higher fermentable foods and higher insoluble fiber foods because my gut just doesn’t have the capacity to digest those. And I think that’s maybe important to mention for people, especially if you’re newer to this conversation, because a lot of those foods, on the surface, seem very healthy—asparagus, broccoli, cabbage, cauliflower. Aren’t these things really good for you? Well, context is very important, and the person is very important. And I generally see that foods like this are harder for a gut to digest. And so the more unhealthy the gut or the more damaged or inflamed the gut, the more careful we have to be with those things. And just like Steven is saying, you may go through a period of stress where you have to cut out some foods like the ones I’ve noticed are my trigger foods or whatever trigger foods you’ve noticed for yourself and then bring yourself back to a safe zone diet, let everything calm down, and then rebuild from there. SW: Yeah, totally. I think that’s—again, people—as humans and as patients who are just in it, suffering, even if you’re a super intense patient like I was and like you were where we end up going into this for our work in life, it’s even overwhelming just learning about all the nuances of the pros and cons of eating broccoli—like, it is raw broccoli? Is it cooked? Where did it come from? SW: And so again, I try not to really—let’s just separate foods into more inflammatory and less inflammatory; more nutrients, less nutrients. And then with those guidelines, just eat what you feel compelled to eat. And if it does your body good—if you can digest it, assimilate it, you feel good, then I don’t like calling foods healthy. I don’t like calling foods superfoods. But just kind of throwing them on a spectrum and just realizing that your taste buds are going to change over time and your ability to digest it over time. DrMR: Yep, totally agreed. And it reminds me of this carb renaissance that’s occurring right now where some used to be of the belief that you had to be lower carb and that starches were evil. And even gluten-free grains were evil. And there is definitely a subset of people that do better on more of those in their diet. And so totally, I totally agree. It’s not as simple as saying good foods, bad foods, but just trying to get a person to a point where they can figure out what they’re going to thrive on and what they’re not going to thrive on. So I wanted to ask you about tips and tricks for getting started. You mentioned your e-book, which I’m thinking is probably the best place for people to get started with this. But are there any other simple, introductory resources if someone didn’t know a lot about this and was looking for a really simple, step-wise guide to get through this? SW: Yeah, definitely. If you just go to SCDLifestyle.com, right on the homepage there, there’s a free intro diet guide. It’s 35 pages long. It will step you through the first 7 to 14 days of the Specific Carbohydrate Diet for free. We also have an “About SCD” page that kind of gives you a better overview of what foods commonly work for people. But yeah, in general, honestly the best thing to start with is cooked meats, fruits, and vegetables. So cooked is important because cooking breaks down the cell walls and allows things to be more easily digested. And notice, I didn’t say you could eat nuts. I didn’t say you could eat diary. I didn’t say anything about legumes or eggs. Those four foods, in general, can be like the four horsemen. And you could also throw in high sugar consumption, like if you go on one of these diets and all of a sudden you’re eating two pieces of fruit at every meal. But in general, I would like to advocate that most people that I’ve worked with and I’ve seen, if you just start with cooked meats, fruits, and vegetables, that doesn’t have to be a ketogenic diet. It will work for almost everybody as long as you typically take betaine HCL if you have low stomach acid, which not everybody will. But what I’ve found is that a pretty dang large subset of people, when they’re first start these diets, and then some really powerful digestive enzymes typically. And if you have those two tag-team supplements—and the reason why I like those supplement is they’re really the building blocks for mechanical digestion. In other words, they’re actually needed for your body to process meat, for instance. So if your mechanicals are wrong on the inside—or not wrong—if they’re wounded. If the mechanicals of your body are wounded, your ability to actually digest even what we’re describing as a restricted but super healthy diet, it still might not work for you. And so there are a lot of people who will go AIP or low-FODMAP, SCD, GAPS. And they forget about questioning the assumption that their body mechanically is ready to do the work. And so I’m also a big proponent—there are several articles on our website. You can just Google, “betaine HCL SCD lifestyle.” It walks you through a protocol to test it because it’s not right for everybody—several resources on enzymes as well. But I think it’s just really important for me to mention that because I do think that we should all question the assumption about whether or not the body is capable of digestion in its current state of health. And regarding HCL, in the book—and maybe I should mention that it’s looking pretty definitive that the book will release very early in 2017, January or February 2017. So that I’m really happy about. And, God, it’ll be nice when that’s done. But we go through a pretty comprehensive review on the issue of HCL. And there are a couple important points. And we help people figure out where they fall within this whole conversation. But we have to look at—or I think it’s advisable to look at what’s the incidence of ulcer? And what’s the incidence of documented hypochlorhydria? And who is more at risk for ulcer? And who is more at risk for hypochlorhydria? The one thing that I’ll offer here without getting too into the details is there is a markedly higher incidence of achlorhydria or hypochlorhydria or atrophic gastritis that’s also known in populations with autoimmunity because one of the main, underlying mechanisms of low HCL is autoimmunity against the parietal cells in the stomach. So we give a nice guide and outline for that and recommendations for HCL but also recommendations for healing the stomach if they have either high acid or if they have ulcers, which can be provoked by acid. But definitely agree that digestive acid support and enzymes can be super important. There was one other thing that popped into my head that I wanted to mention regarding—because I know one of the initial phases can be kind of like making homemade soups and using different bone broth or soup or what have you. And certainly agree that that can be very helpful for a lot of people. But there are some people that don’t seem to digest soup well. And I think it’s probably because of glutamic acid, that soups can be a little bit higher in glutamic acid. But I noticed that some patients, and even myself included in this, will get pretty bad brain fog, fatigue, and irritability if they consume too much soup. And it may just be a not-super-robust ability to break down and process glutamic acid, maybe to an extent, histamine. So we will have people use the Master Cleanse in place of soups if they notice that kind of reaction. But, Steven, have you noticed any kind of reactivity to soup like that? And if so, do you have any work-arounds for that? SW: Well, I definitely have seen some reactivity to it. I think that it could be the acid that you just mentioned, glutamic acid. I think sometimes also depending on—for instance, in the Specific Carbohydrate Diet, it’s actually chicken soup. And so if someone chooses to make a different type of soup, sometimes the fat content can be higher and kind of through the roof for them. And they’re not ready to deal with that kind of fat content. But what I’ve seen to be the easiest seems to be getting chicken thighs and putting those in the Crock-Pot with some carrots, a little celery, things like that and trying that from a soup perspective. I’ve seen more of the reaction you’re talking about—at least what I picture the reaction you’re talking about—with people starting off with homemade bone broths actually. DrMR: Interesting. So there’s no meat in the soup? They’re just cooking out the bones? SW: Yeah, yeah. Where I’ve seen a lot of it is people who start on the GAPS diet and then end up coming to our website and doing SCD because at least they perceive that on the GAPS diet they need to be making bone broth every day and drinking it every day. And they seem to do better on a meat broth than they do with the whole bone broth. DrMR: Interesting. I remember Allison Siebecker mentioning some compound that can be kind of cooked out of the bones that may aggravate SIBO. And I wonder if that’s the connection. But I’m blanking on the name of the compound. But yeah, that’s a great tip for people who maybe are struggling with bone broth to try removing the bones and just using, as you mentioned, chicken thighs. I’m assuming that’s not a bone-in chicken thigh. It’s a boneless? SW: Yeah, you could do either. But the bones—in the free download that’s on my website, we kind of walk you through how to make it, literally with pictures, every single step because I’m an engineer. And I didn’t know how to cook when I started this stuff. So I literally needed somebody to hold my hand at every step because I didn’t know what a colander was or—I didn’t know anything about the kitchen. SW: And so we go step by step. We actually have people cook it with the meat in and then pull the meat out, strain the meat out, shred it up, remove the bones if you used bone-in chicken thighs or something like that or if you used a whole chicken carcass, and then throw the meat back in. But yeah, we have a lot of people who just do it with boneless chicken thighs. Some people do it with chicken breasts. I think the thighs have more nutrition content. So if you’re not going to use a whole carcass, then I would go with, yeah, some sort of thigh. DrMR: Gotcha. Gotcha. All right. One or two questions for you as we bring things to a close. I’m sure you have some good thoughts on this because I think we have a pretty similar perspective on life balance. And I know this is a broad question. But what are your thoughts on balance for people out there trying to get their health right? Do you have any thoughts on balance? DrMR: Balance of not maybe getting overly obsessed about health and getting overly neurotic about health, how to keep a healthy balance of stuff outside of health in their lives, or how important that is for their health. SW: Yeah, interesting. I haven’t thought about this question in awhile. Where I’m at today with it is I would encourage self-awareness in service of balance. I don’t really necessarily think there’s anything called balance. I think work-life balance is a myth. I don’t buy into this idea that you can have 20% over here, 10% over here, 50% over here, like you can just compartmentalize your life and that’s called balance. I don’t buy into that notion. Where I’m sitting at right now as the recording, I would say, self-awareness. So if you’ve been not in touch with your body, if you’ve been sick for many years and now you’re chronically ill, you’re finally at your breaking point, you’re going to take action; I think it’s a natural and appropriate response to swing the pendulum far from—let’s say that was the left—far to the right where you are all in. Most of what you think about all day long for a number of weeks or months is what diet, what supplements, consuming podcasts like this, really getting educated and getting rid of your pain. So as you notice that, “Okay, wow! It’s been 90 days. I’m really saturated. I figured out a few things. I’m now working with Dr. Ruscio. He’s helping me. He’s on my team now. So I’m not totally lost in the woods.” Now, I think is when it’s a—let the pendulum come off the right side and go back to the left. Allow yourself to relax around progress in health because progress—as in if you’re going from pain and sickness to robust, resilient health—it is not linear. Like 100%, I can—there are not a lot of things I can guarantee. But I can guarantee you the progress from totally sick to completely, robustly healthy is not a linear progress. There are dips. There are setbacks. It’s like everything in life. There’s a rhythm here. And so let that pendulum swing. If you’re getting frustrated, if you’re suffering and whatever you’re doing right now in health isn’t really working, that’s not the time to double down. If you’re already spending 80% of your time and effort and money on health and you’re not seeing results, take a week or two off. Let the pendulum slide back rather than doubling down and pushing harder because every time I’ve doubled down and pushed harder, it’s pretty much been a disaster. And I made bad decisions with my money and my time and my body. But every time I can get a little perspective on what I’m doing and I realize, “Wow! I’ve been really pushing it hard here. I’ve been learning a lot about health. I’ve been trying these new experiments. And it’s been going on for several months.” And I allow myself just to let go for a little while, let the pendulum kind of swing back a little to the left of, “Okay, we’ve made some progress. Let’s sit here and integrate for a little while.” And then you’ll be over there for probably a week or two, maybe a month. And you’ll probably at that point be resourced enough to dive back in. And so I wish someone would have told me that progress isn’t linear and that it’s okay to just rest. There’s no race going on here to get to resiliency. This is your life. And so if trying to get healthy is making you unhealthy, which it does happen—this happens for a lot of people—if you can see some awareness on that and relax, I think that might be what I would call balance. DrMR: Yeah, no. I think that’s incredibly well said. I agree pretty much with everything that you said. And I guess with that as a segue, what might be the least “healthy” thing but the most fun thing that you’ve done lately? SW: The least healthy thing but the most fun thing. That’s a good question. DrMR: Before I ask it. It can be a stumbler for a lot of people. But staying up late, drinking wine, eating off-plan food, eating at a restaurant that maybe was really good but not the best food, smoking a cigar. DrMR: Anything like that come to mind? SW: Yeah, something like that does come to mind. I went away two weekends ago on a birthday party retreat up into the mountains in Colorado here. And, yeah, it was a great time. The food was high quality, but I didn’t ask. I didn’t verify that every piece of food was gluten free. I didn’t ask where it came from. I had plenty of alcohol. I had a few cigarettes. I just let myself go for the weekend and not monitor myself. And I guess I could classify all those things as somewhat out of the norm for me and somewhat not healthy. But at the same time, it was my weekend to let go. And I do that from time to time about—it’s become more of this balance thing we were speaking about with the pendulum. If I’ve been like—I was going full keto for the first eight weeks this year and really testing some of the new, cool supplements and just having fun trying to figure out. I hadn’t tried it in so many years. And so I just want to try it. And all of a sudden, I just got sick and tired of putting all that effort there. And I remember going out to a restaurant that week. And it was a new restaurant that just opened here in Boulder. And I was out with my girlfriend. And I was like, “You know what? I’m just going to order this appetizer. From the menu, it should be gluten free, but I’m not even going to ask. If they put some little speckles of gluten on there somehow or it crept in through the processing, whatever. I’m off the clock tonight.” And so I do that probably once a month, maybe twice a month. DrMR: Nice, yeah. I like it. I think it’s important to keep your sanity because if you’re always, like you said, monitoring yourself, you can exhaust yourself and just get kind of burnt out. Totally. So, Steven, if people wanted to learn more about you or read more of your stuff or what have you, where is the best spot to track you down? And then is there anything that you want to make people aware of? SW: Yeah, sure. We’ve mentioned it a few times during the podcast here. But the SCD (Specific Carbohydrate Diet) Lifestyle.com is the best place to find my work, a lot the writings, a lot more detail. We have the intro diet guide there. We have a solving leaky gut quiz that you can take. So if you’re someone who is just getting on the bandwagon, wondering about leaky gut, there are some really awesome resources there for autoimmune people and leaky gut as well. So I think that’s the best site. DrMR: Sweet! Well, thank you very much, my friend, for taking the time. As I knew it would be, this was a great conversation. I’m hoping people get a lot out of it. And until I see you again next, keep fighting the good fight. DrMR: All right, talk to you soon. Longtime listener. This was the most useless episode–I’d stick to practitioners, Drs and researchers. While I’m sure Steven wright and his scdlifestyle platform has helped people heal I couldn’t help but feel that this interview was more about promoting his website and point of view than about educating listeners. Most of your guests join you on the mission of educating your listeners and I always want to learn more. anybody interested in learning more about food and digestion is better served skipping this episode and jumping straight to Allison siebeckers interview. I’m glad you have found most of our information helpful. In the future please try to have nicer tone as you can get your point across here in a much more tactful way. I disagree. I listen to a lot of podcasts and most are guilty of what you complain of here. Although Stephen Wright does have something to promote, I found the episode interesting, and took away a few useful nuggets. I have a crockpot full of chicken thighs bubbling away, as I write this. I really enjoyed listening to this episode. Steve is a great guy who is passionate about helping people with gut issues, and I think he is a great example of a layperson who has turned their health around through self-education and determination – plus seeking out competent functional medicine practitioners. That being said, I would be interested if the efficacy of a monosacchiride-based diet has been tested in clinical trials for conditions such as Coeliac, Ulcerative Colitis, Crohn’s etc.? Is there good science to support this kind of diet? Oh, and when is your SIFO guest coming on? I’m very much looking forward to that on! Thanks for your feedback and glad you liked the episode. Yes, the SCD diet has been used successfully for IBD. Similarly the low FODMAP diet has been used for IBS and IBD. Had to reschedule the SIFO guest. Hopefully soon!